I was out in the front yard playing with a friend and her little girl, when Dave’s foot moved beside me and drew my eyes down to the grass. I reached down and plucked a four-leaf clover from the lawn and handed it to my friend. She was amazed at how I just reached down and found it like that, but that’s not weird to me, because I’ve found so many of them. I have an eye for things that are different from their surroundings, things that stand out. I’m usually good at spotting a typo or finding a lost earring back, and I think that’s what makes the clovers stand out to me. One summer, I found at least two dozen while hanging out in the grass at day camp, and pressed them all in a big book (the collected works of Edgar Allen Poe) for safekeeping. 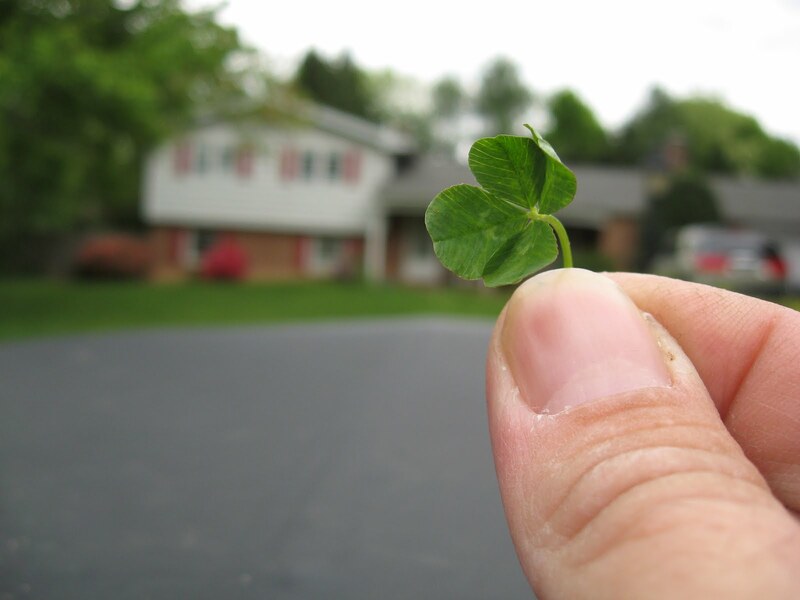 When I first brought my Dad to our new neighborhood, after we’d closed on the house but before we moved in, I found a four-leaf-clover by our new mailbox and decided maybe it was a sign that the house would bring us happiness. Despite the effort we’ve had to put into it, it has; but, you know, finding and keeping dozens of four-leaf clovers over the years hasn’t really added up to a particularly lucky life. Like anyone else, I’ve had good and bad times, some brought on by my own efforts or failings, and some despite them. Maybe, in the end, the key to luck is passing it on and sharing it, so I handed the clover to my friend, hoping that the symbol would bring her some joy. She gave it to her little girl, who twirled around with it for a minute before letting it drop back to the grass as the ran for the daffodils. I think she got it right.